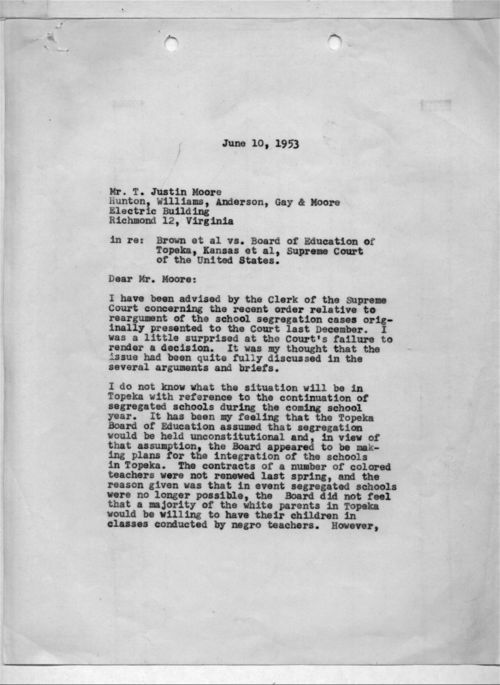 In this letter, assistant attorney general Paul Wilson responded to T. Justin Moore's query about the desegregation case Brown v. Board of Education of Topeka. Wilson writes that he is not fully informed of the current situation in Topeka, but that he believes the school board is beginning the integration process in anticipation of the court's ruling that segregation is unconstitutional. He also mentioned that some contracts for African-American teachers had not been renewed because the board felt that many white parents would not want their children to be taught by black teachers. Wilson was a defense attorney for the Topeka school board and he argued their case before the Supreme Court. On May 17, 1954, Chief Justice Earl Warren handed down the ruling that segregated educational facilities were indeed unconstitutional. This source describes how Topeka schools began the process of desegregation even before the court ruled that segregation was unconstitutional. Consequently, it would work well when grouped with other sources describing the process of integration, particularly integration's affect on black educators.